The curtain closes on another week in the world of wearable tech, and it's been a landmark one. The arrival of the HTC Vive our faces – just weeks after Oculus Rift started shipping – means that the virtual reality party is well and truly under way. But if you've been living under a rock this week, fear not. We've rounded up all the major news and talking points of the week in one place. 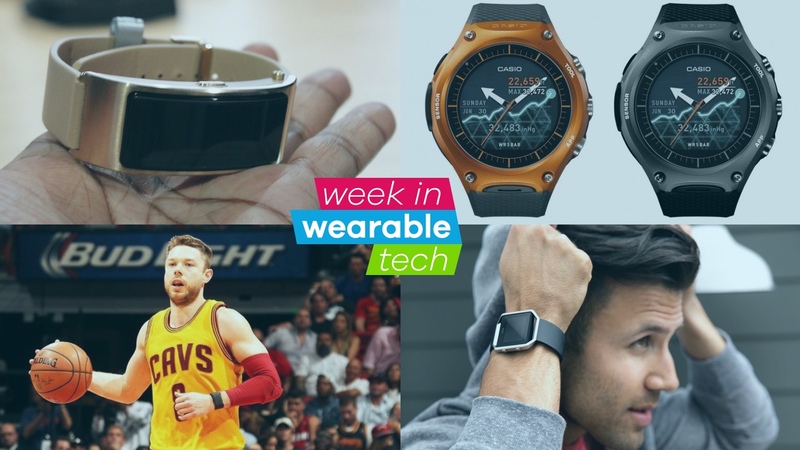 This is the week in wearable technology. Our HTC Vive review landed this week, and it's fair to say we love it. Obviously go and check out the full verdict, but it's a great start for the technology, which unsurprisingly triumphs thanks to the Lighthouse room tracking technology, that adds an extra dimension to gameplay. However, let's not get over excited about the HTC Vive being anything more than a strong start to a niche technology. HTC Vive games are still largely non-existent, there are some performance niggles to overcome, and you're essentially paying $799 to play some free demos. Don't forget to check out our round-up of the best VR headsets, and check out our head-to-head between the HTC Vive and the Oculus Rift. One of the most exciting smartwatch launches of the year is the Casio WSD-F10 Outdoor Smartwatch, but it seems that Europeans may have to wait a bit longer for its arrival. A Casio spokesperson confirmed to Wareable that the company had no current plans to launch the rugged smartwatch outside the US or Japan. That won't stop hardened fans from having one shipped from the States, but it looks set to cripple the success of the most notable Android Wear smartwatch of the year. "I think it's a great product and Apple's a great company, but it's a product that probably does too much," said Park. "Really our research has shown that people who search for an interest in the Apple Watch do not overlap with people who search for and are interested in Fitbit." Fitbit's shares dropped dramatically after the release of the Fitbit Blaze, in part because of a perceived similarity with the Apple Watch, and investors are wisely wary of the fledgling fitness brand competing toe-to-toe with Apple. And it looks like the last week's news is a carefully orchestrated fight back against those worries. Make sure you check out our full Fitbit Alta review and Fitbit Blaze review – and of course our round up of Fitbit Alta tips and tricks. The original Zepp tracker was a must-have for any amateur golfer, and the company has returned this week with an updated version. Zepp 2 makes minor cosmetic tweaks, but the headline changes are under the hood. New coaching insights are the order of the day, with videos from a range of golf and baseball pros to improve your technique. Don't forget to check out our round up of golf GPS watches and swing analyzers that will get you putting better than Ernie Els. Wearables have been creeping into sport for a couple of years, but this week the MLB cleared tech for use in game for the first time. Teams will now be able to use the Motus baseball sleeve and Zephyr Bionharness heart and breathing monitor. There's also a swing sensor, but only for training and warm ups. In the NBA however, things work a little differently as one player was banned from taking the Whoop wearable on court. The wrist worn tracker is designed for elite athletes but is currently banned for use during games. Check out our round up of the wearables now making a play in sport, and our big tests of cycling trackers and swimming gear. Huawei dropped a new version of its fitness tracker that you stick in your ear this week, at its global event in London. The Huawei Talkband B3 features a 0.7-inch touch OLED display with a 128 x 80 resolution, and it pops out of the wristband to become an old school Bluetooth headset when you receive a call. Yuppie-tastic.